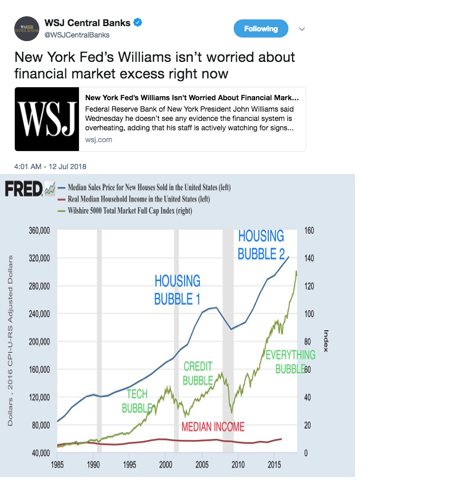 We don’t see any bubbles (’00, ’07,’18)…the Fed is not the cause of inequality….we don’t manipulate markets ($15T glbl QE+0% rates)…inflation is too low! David Rosenberg: I’m accused of ‘confirmation’ bias and yet last I saw, the broad NYSE composite is no higher today than it was back in December, and has not made a new high since Jan 26th. Sounds a whoooole lot like a classic topping pattern. Think 1989, think 2000, think 2007. I'm accused of 'confirmation' bias and yet last I saw, the broad NYSE composite is no higher today than it was back in December, and has not made a new high since Jan 26th. Sounds a whoooole lot like a classic topping pattern. Think 1989, think 2000, think 2007.